Rep. Andy Olson’s whiteboard outlines various marijuana issues a work group is tackling. A work group of legislators has been meeting to try to straighten out Oregon’s marijuana law, but apparently it’s a tough slog. Rep. Andy Olson, R-Albany, is one of the group’s members. He hopes the lengthy discussions twice a week will result in a bill, but he doesn’t know when. 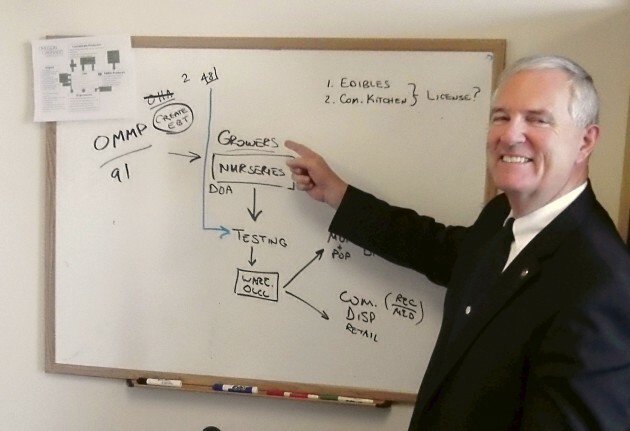 In his Capitol office Olson has a whiteboard where he diagrammed the issues. Last Tuesday the board looked relatively clean, but Olson says it used to be much more densely covered before some of the issues were at least tentatively cleared up. One of the issues Olson is concerned about is what he calls “card stacking.” It’s the practice of some growers, especiallty in Southern Oregon, to produce far more marijuana than their patients can legitimately use, resulting in a surplus that is — most likely — sold illegally in other states. The work group is also trying to to reconcile previous law on medical marijuana with the 2014 initiative that legalizes and attempts to tax and regulate recreational pot. The Oregon Liquor Control Commission is supposed to come up with rules by this summer, when the legalization takes effect. Meanwhile, at least 19 separate bills on marijuana have been introduced. Two of them would outlaw marijuana outlets in wide sections of cities or towns. HB 2040 would ban any marijuana facility within one mile of a school. And HB 2041 would allow local governments to impose the same two-mile-diameter no-pot zones..
Another bill, SB 540, would prohibit recreational and medical marijuana facilities within 1,000 feet of any child-care program. And HB 2781, would outlaw child care facilities where any person with a “regular presence” has a medical marjuana card. Oregon already bans smoking tobacco in a car where children are passengers, and HB 2854 would include marijuana smoke and nicotine vapor in that ban. Andy, and the other legislators should know better. Marijuana has ben readily available at location all across cities, towns, counties and states for well over 40 years. It’s on your block. It’s in houses next to schools, churches and hospitals. It’s just been unseen to average people, mostly because they didn’t want to look. And it was available to people of all ages because it was part of the illegal underground. One option would be to put it in state liquor stores, if we’re going to keep state liquor stores. Interesting. I have to wonder, does it all need to be so complicated? Perhaps I’m naive but after reading this, if all these proposals come to pass, it seems that someone possessing a legal substance might have to take a very carefully planned route just to cross town….any town….including those we aren’t familiar with, just to be compliant with the law. Would some of these proposals also include signs warning people they are approaching within 1,000 feet of a school or daycare? What about people that live within that distance from such a school or daycare facility….would they be denied legal use of pot within their own homes? Are we going to create a “gotcha state” where people can be in violation of a law without intent? Ignorance of the law is no excuse, but how easy would it to be ignorant of where a daycare facility is located? A school in a town we’re not familiar with? GOTCA! I had imagined after this law was passed that recreational pot would be treated, more or less, like alcohol. There are no such exclusion zones for alcohol, which to my mind is THE gateway drug (if not nicotine) and both of those substances are far more damaging to society overall than marijuana, in my (long held) view. Interesting that nothing was mentioned about vehicle operation. Will there be a “legal limit” on blood THC level? How will it be determined? Do we even have the technology available (as we do with alcohol) short of a blood draw for testing at a vehicle stop by the police? I am suggesting the guidelines that surround alcohol and tobacco will work just fine 99% of the time for marijuana. We don’t need to become a police state over this. Many people assume that marijuana use will see a dramatic increase when pot becomes legal. I don’t think so. Those that want to smoke it already do. It has been readily available to anyone who wants it for many decades and making it legal isn’t going to change much of anything, except that people won’t be in violation of a law for an activity they may have been participating in for years. Further, if governments tax the hell out of the stuff, the “black” market for pot will continue like before, unabated. Unintended consequences? It seems the state legislature has recently viewed the old US government anti-pot movie “Reefer Madness” recently and bought into it’s message hook, line, and sinker. Reality is far different. And the federal classification that equates marijuana with heroin is ridiculous and always has been. That people use marijuana is nothing new. It seems the state legislature is making a really big deal out of this. I think they have better things to do with their time. No responsible adult wants to expose kids to pot any more than they do tobacco and alcohol. There will always be cretins with no respect for others that will act irresponsibly, but history has proven we can’t legislate against every one of society’s ills. Common sense can’t be legislated. Haven’t we learned that yet? Many people may think I’m a staunch conservative, and politically that’s true. But on many social issues, I’m more of a Libertarian, and this is one of those areas. If people REALLY want to make a difference they should concentrate their efforts towards the eradication of methamphetamines, far and away our biggest “substance” problem…..AFTER alcohol. Alcohol kills so many in so many ways, some obvious and some not so. I’ve recently lost two friends to alcohol…and they didn’t die on the highway…..but from livers that resembled swiss cheese. Meth drives more than half the property crime in Oregon according to what I’ve read. There are the anti-pot folks out there with all sorts of wild claims that defy what my eyes have told me for over four decades. They’re making mountains from molehills in my view. Meth and alcohol present REAL problems that need to be addressed. Just my $0.02 worth. Let common sense prevail. Upon further reflection I have one additional thought where “edibles” are concerned. Let the people buy the marijuana and consume it by whatever method they wish. Making brownies, cookies,and other baked goods is relatively simple in the privacy of one’s home should they so wish….and then it is THEY, not a “manufacturer” or other commercial enterprise that will be liable (to themselves) for the results. I’m not sure why we need to provide a mechanism for people to buy foods containing THC for the masses. Generally, anyone that wants to make the stuff at home would be able to, legally, for their own consumption. Information and recipes can be googled easily and there is a wealth of info out there for those so inclined. And just for clarification, I am not a user of marijuana. Quit the stuff many years ago. Nonetheless, I still think the big “to-do” over it is way overblown as I commented above. Again, this doesn’t need to be complicated. Let common sense prevail. I read the legal pot initiative very carefully. It does not in any way change OMMP. There seems to be a paradox. Do not legalize and see what happens in Colorado. Legalize, but change the law everytime we blink, even before it is implemented. Sigh. I expect Olson is doing the right thing but the real OMMP win would be low THC munchies in the state controlled formularies. That solves multiple existing ethical issues.